I am now blogging at kathrynjones.tv. Fear and Hate breed blatant untruths and spin. How do they contradict themselves so irrefutably and unabashedly with out so much as a grimace of shame? thank you John Stewart and The Daily Show. This week on The Crabbo and Jabbo show meet Emily Rubin from Wash and Dry Productions… Producers of “Dirty Laundry: Loads of Prose”- poetry readings at the laundromat…yes…the laundromat! We will see some footage of their most recent laundromat reading and talk to Emily about why she thinks poetry and laundry soap are such a natural fit. Our musician of the week (courtesy of Ariel Publicity…of course) is Alternative, Rock, Pop, Hip Hop / Rap, Funk band… Winzenried…. fun, funky and totally original, tune in to hear two of our favorite Winzenried, aka Hollywood Drunks, singles. 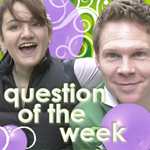 And of course and fantabulous tech tip of the week, a question of the week, and so much more! Tune in to The Jabbo and Crabbo Show Monday May 5th at 9:15 est and let us know if you have an event you want us to promote or an artist (including you) you want us to feature. Fraid your gonna forget? text idare to 414111 for a free subscription to Jabbo and Crabbo text alerts, or shoot us an email us and we will email you right before the start of the show. It has been so long since I’ve posted to this blog…the sidebar widgets are sadly out of date, and my life has moved on in ways I would never have imagined since “Queston of the Week” first gave me wings. I have a project in development that is the light of my creative heart, but I also have a new project with my husband, that focus on many of the things this blog focuses on…. namely… how to create the life of our dreams and to tell the world that who we are is perfect. Its been 8 months since “35” premiered. The first web drama to stream live on the web, “35” was a labor of will, of love, of pain, of tenacity and in retrospect… of celebration. In the past two years the web 2.0 community has unleashed a torrent of tools and sites that now make it possible for artists of all sorts to Green Light their own creative projects. To produce work on a scale which only months ago would have been deemed impossible, and to reach a global audience with our music, our sculpture, our crafts, our videos. We no longer have to wait for casting directors, for investors, for galleries or film festivals to deem us worthy… we can stand behind our own work, tell the world that we are passionate about what we do, we believe in ourselves and that is more than enough! The Jabbo and Crabbo Show- Live and Interactive The artists (and otherwise cool person’s) guide to creativity and technology on the web. It is Guiesseppe and my hope to build a community of artists who support one another in living the lives we dreamed of and bringing our work to the Internet. We will offer everything we have learned this past year and will offer up tips each week that will make it easier for every artist to publish their work, to collaborate with other creatives, to market their art and (hopefully) live a more fulfilling life. We hope you will join us on Mondays at 9:15 at . If you would like to receive an email reminder right before we go live each monday, contact us and we would be more more more than happy to oblige! We also want this show to by YOUR show… so let us know what you want to learn about, and what topics you want to discuss. Join the Community! you can find us on synchronis.tv! I am over here! making my dreams come true!!!! this link takes you to iTunes cuz wordpress wont accept the correct code! A nation built on Fear and Lies is a nation that has sadly lost its way. episode 4…live tonight at 9pm eastern! Live TV! Overcoming My biggest Fear! If you had to choose a song that was autobiographical, what would it be? How can NYC support digital media? What is the hardest thing I’ve had to overcome???? What’s the hardest thing you’ve had to overcome? Leave me a Voice Mail!!!!! !